Drupal is a free and open source content management system framework developed in PHP. The Drupal CMS makes it simpler to build, handle and publish your required digital content to any of the devices, at any period of time. When it comes to choosing the precise CMS, there are many options, and we at I Tech Zone will guide you in picking the best. With Drupal content management system, we deliver API driven content approach, multi-lingual functionalities, responsive methodologies, mobile-based solutions, native web services and perfect integration with present technologies. We deliver scalable, open platform and seamless digital experiences with Drupal. 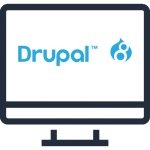 Drupal offers in-depth capabilities and endless litheness on the web platforms. Our CMS solutions offer quality template integrations, the swift way in controls, better maintenance features, media, document & file management functionalities, social media integrations, internationalization and localization, content collaboration, aggregation, syndication, and versioning. We build different wizards for creating dynamic database oriented forms, ease of access features and scalability for future updates.